At Schumacher Automotive Group, our employees hold themselves daily to the “Come Join The Family” standard set by Chuck Schumacher decades ago. Our goal is to make every shopper that steps into a Schumacher Automotive Group dealership feel like family and for each customer to witness Schumacher staff’s commitment to finding them the best vehicle for their lifestyle – at a comfortable price. 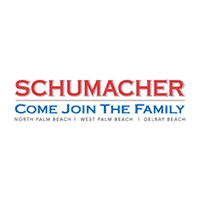 Whether you visit a Schumacher dealership in West Palm Beach, Lake Park, or Delray Beach, you will have the same warm and welcoming experience. Schumacher Automotive Group’s commitment to our South Florida clients goes beyond the showroom. From West Palm Beach to Lake Park to Delray Beach, Schumacher Automotive Group has had a presence out and about within our Southern Florida communities for years; our monetary and volunteer support has grown tremendously in the recent past. Please see upcoming events and highlights of Schumacher Automotive Group community involvement below – this information will change monthly, as we include photos from past events and information regarding those coming soon! Join us outside our dealerships and in our beautiful communities, where we can help others and get to know you, our customers, on a different level. We thank you for your business and look forward to adding you to the family!